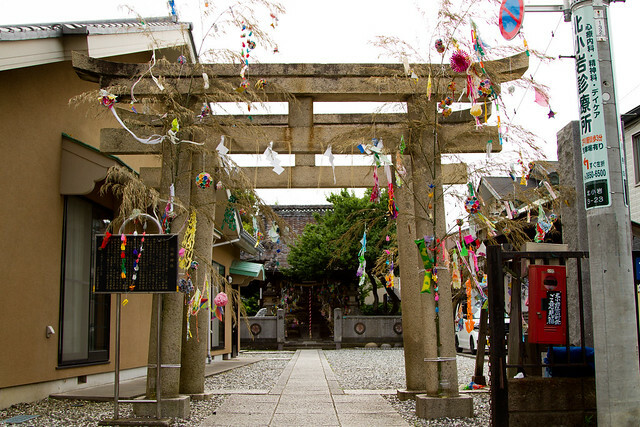 Every year in Japan, there are a huge number of festivals celebrated across various shrines, temples and just for the sake of it. 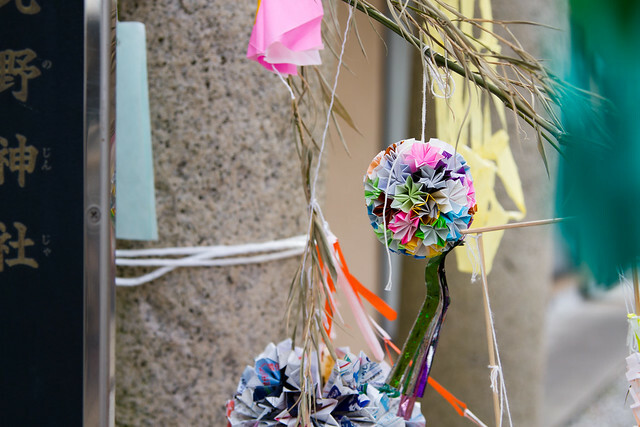 Among them are a couple known throughout the world for their appearance, even if you don’t know much about the meaning, and one such festival is Tanabata. It takes place on the 7th July in some areas of Japan, and 7th August in other areas because it’s believed this is the closer true date to the Chinese lunar calendar where the festival has its roots. 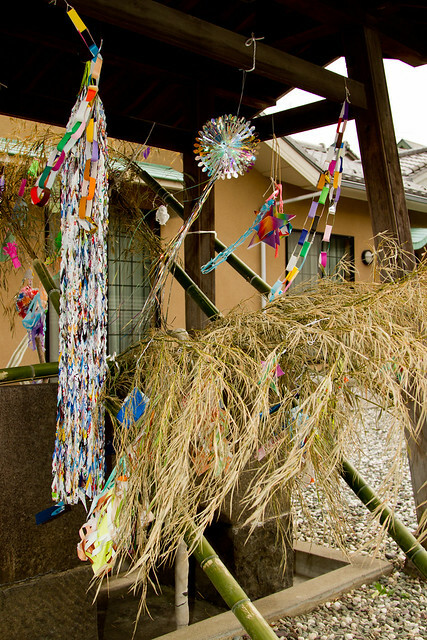 All across towns in Japan Streamers and decorations are put up, with the focus being on decorated bamboo branches. 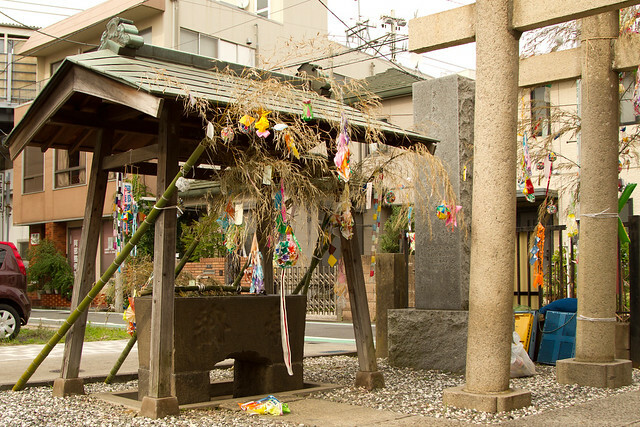 The pictures here are mostly from a small shrine near our house, and the Edogawa train station. 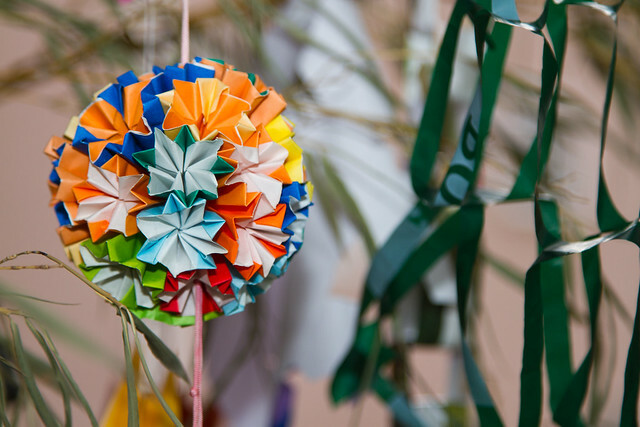 A bit like Christmas Trees back in school in the UK, local communities come together and create paper decorations. 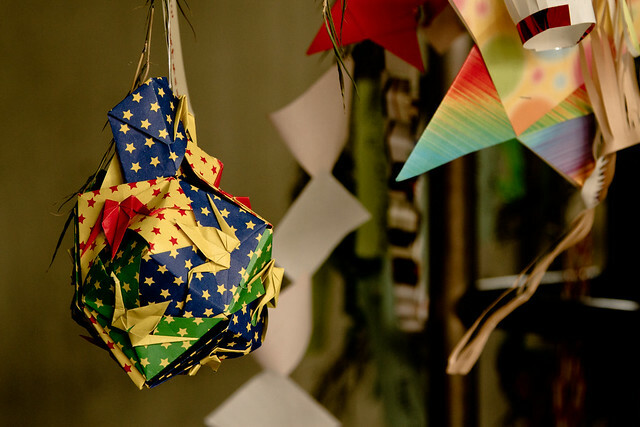 Some are delightful and elaborate, others like garlands of paper cranes have deeper meaning, and some are obviously made by kids to represent their favourite characters or whatever else they want. 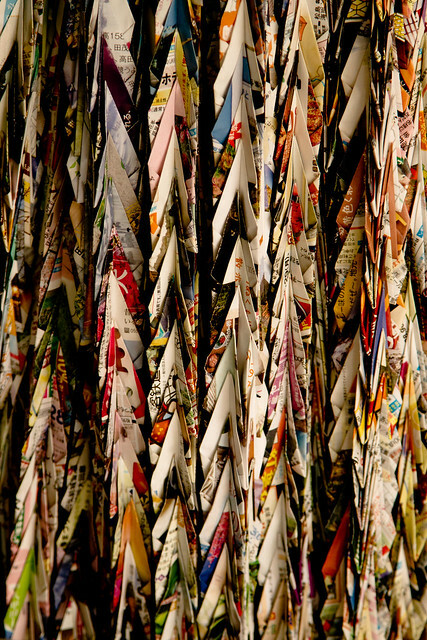 The fact is, whether your’e an origami artisan, or just want to get involved, everything counts. e.g. This little guy is Whisper the Yo-kai (ghost) from currently popular anime and game Yo-kai Watch. Expect it in the UK soon a’la Pokemon 15 years ago and be prepared for toys to sell out. 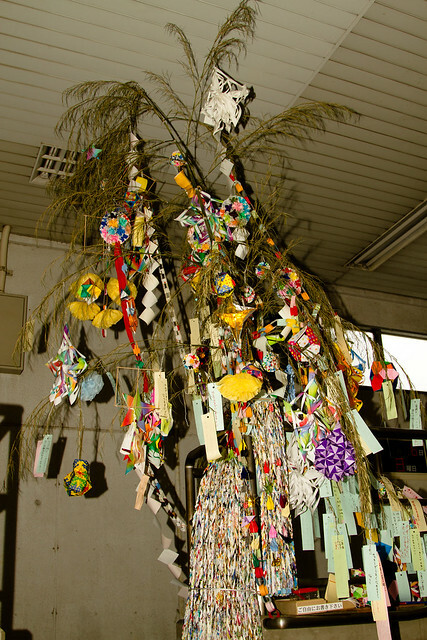 After the decoration, you write a wish on a ‘Tanzaku’ (strip of paper) and tie it to the tree. Again, whether it be world peace or for ‘The Last Guardian’ to finally get a release on PS4 *cough cough* you just write it down and tie it to the tree. 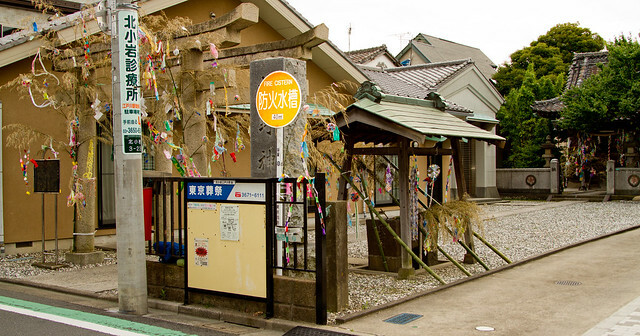 From what I’ve read, some places burn the branches on the evening of Tanabata as an offering to Orihime and Hokuboshi. The abridged version of the Tanabata story is that a princess from heaven (Orihime) fell in love with a guy from earth. She found out he had tricked her into staying on earth and went back to her dad’s place in the sky. As she was leaving, she told the man to make 1,000 pairs of straw sandals and bury them under a bamboo tree to show he really loved her. He eventually got to heaven on the big bamboo tree that grew as a result of this, but like any good father-in-law, Orihime’s dad stepped in and gave him a task to further prove his love. Earth guy was useless and this resulted in the Milky Way being ‘born’ (Something to do with melons and probably related to why in Japan a Watermelon can cost around £20) – separating the two lovers for eternity… except Tanabata’s dad wasn’t so bad after all and let’s them see each other on one night every year. You guessed it, 7/7. They’re so happy to see each other that wishes are granted and everyone cheers them on by putting up lavish displays. So there you have it. It’s great to see everywhere so bright and colourful, hopefully tomorrow we should have even more great photos from different events happening around our neck of Tokyo, and soon after that come the firework festivals! 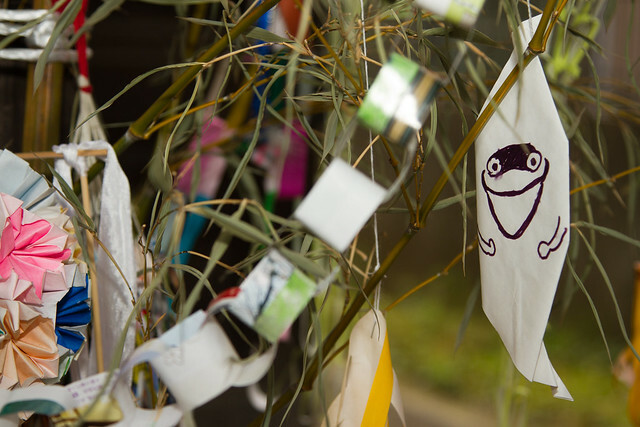 What would you wish for on Tanabata? Let us know in the comments.